The Federal Reserve was originally created out of a belief that interest rates or the price of lending money can materially affect an economy. This notion has guided events over the past 100 years, but in reality, economies are not so easily controlled. The Fed maintained almost zero percent interest rates, 0.25% for nearly eight years, following the 2008 recession. According to mainstream media, the economy is in recovery and we can all breathe a sigh of relief. But last week the Fed increased rates to 0.50% and the effect it had on the economy was unanticipated, as the below article details. It suggests what many have already come to understand, that the Fed has no real power to influence the economy with any measure of precision. It is only the illusion of control that keeps confidence in the system going. But anyone with the eyes to see can clearly recognize that the ship is off course, and even the seemingly all-powerful Fed has no power to stop it. When one claims power they do not actually possess, it is called a confidence game, or more colorfully known as a con-job. It's the belief that one has power, which in and of itself gives one power through the imparting of trust. Trust in this sense, literally breathes life into an otherwise untrustworthy organization. As such, we the people would do well to remove our trust from those individuals that have breached it. If this assertion is true, that there are no more actions that can be taken to stave off the impending economic fallout, then we are truly in unprecedented times. Perhaps the masses will finally stop placing their trust in despotic elites and experts. Why not find the courage to trust ourselves instead? The power to create and maintain a sustainable system of exchange has always been within our grasp, we need only learn the simple tools of trade and commerce that have existed since time immemorial. Immediately after the Fed hiked interest rates last Wednesday – after sitting at 0% for 7 years – markets acted pretty much as one might expect. The Fed tightens monetary policy when the economy is strong so rising stock prices, rising interest rates and a strong dollar are all things that make sense in that context. I am sure there were high fives all around the FOMC conference room. Too bad it didn’t last more than one afternoon. By the close Friday, the Dow had fallen nearly 700 points from its post FOMC high, the 10 year Treasury note yield dropped 13 basis points, junk bonds resumed their decline and the dollar was basically unchanged. Not exactly a ringing endorsement of the Fed’s assessment of the US economy. I’m not saying the Fed’s rate hike is what caused the negative market reaction Thursday and Friday. The die for the economy has likely already been cast and right now it doesn’t look like a particularly promising roll. Raising a rate that no one is using by 25 basis points is not the difference between expansion and contraction. And a bit over a 3% drop in stocks isn’t normally much to concern oneself with; a 700 point move in the Dow ain’t what it used to be. The pre-existing conditions for the rate hike were not what anyone would have preferred. The yield curve is flattening, credit spreads are blowing out and the incoming economic data is not improving. Inflation is running at a fraction of the Fed’s preferred rate and falling oil prices have been neither transitory nor positive for the economy, at least so far. The Fed is not unaware of this backdrop – they may not like it or acknowledge it publicly but they aren’t blind – but seems to have decided the financial instability consequences of keeping rates at zero longer are greater than any potential benefit. A sobering thought that. The stock market drop, the rally in Treasuries, the falling commodity prices, the rout in the junk bond market – none of these are particularly new developments and the Fed’s action last week changed none of them for longer than a few hours. The stock market, in case you missed it, peaked almost 18 months ago and the average stock is already nearing bear market territory regardless of what the averages might say. The 10 year Treasury yield is unchanged in the last year, something that seems impossible considering all that has happened in that time. The path to those unchanged levels was a roundabout one – volatility is up about a third from last year – but the message is pretty clear. If economic growth was expected to accelerate bond yields would be higher. If corporate earnings were expected to rise, stock prices would be higher. It may be too late to avoid the financial instability issues that have the Fed concerned. As is often the case, the Fed now finds itself monitoring a potential problem created by its own policies. The junk bond bust has been characterized as mostly about energy and that is still more true than not. But you can’t have the bust without first having a boom, this one, like the housing boom before it, a direct result of the Fed’s easy money policies. A weak dollar and cheap credit were the fuel for the shale boom. It only took the end of one of those to usher in the bust and now the Fed is trying to end the second, closing the barn door long after the horse has absconded to the back forty. I have no idea yet how the Fed’s rate hike will impact the economy and markets. 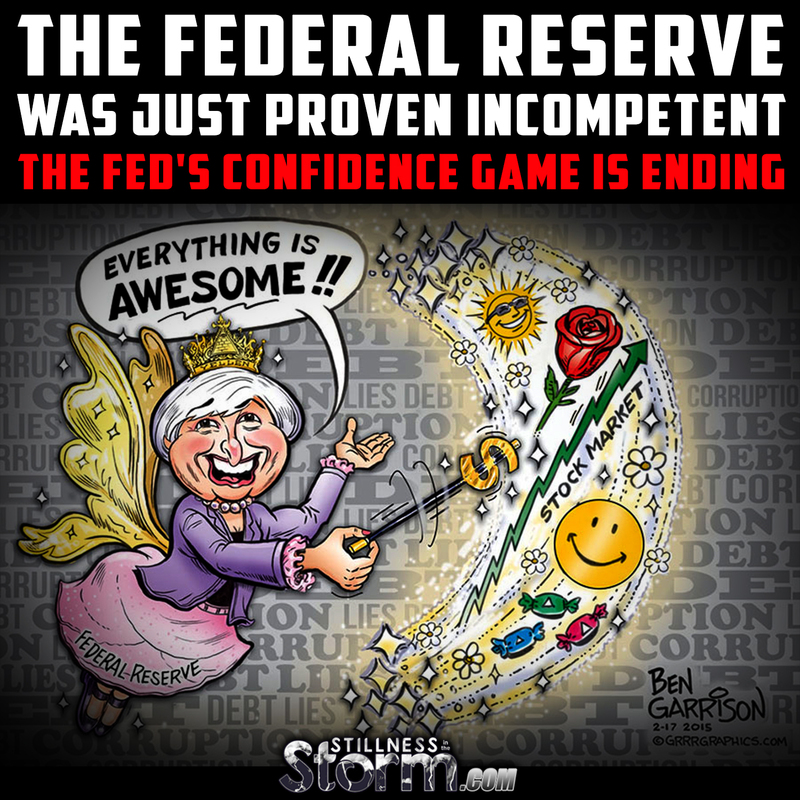 I am certain the Fed doesn’t either no matter how much they might pretend the opposite. We don’t know if the tools they are using to raise rates will be effective or even what effective means. Will the Fed’s use of reverse repos shift deposits from banks to money market funds? That seems to be the consensus but what would it mean for the economy? And what if it doesn’t happen? It seems to me that may depend on whether return of or return on capital is more prized. What about interest on excess reserves? Will there be any impact on lending or are banks’ energy and leveraged loan portfolios already a constraint? I’d bet on the latter right now. The Fed seems to have been operating on the theory that their own views on the economy determine its path. That is probably true to some degree; certainly a Fed chair’s words have at least a short term impact on markets and therefore the economy. But recently the Fed has taken the principle to an extreme never seen. Yellen may well have just hiked rates expecting, hoping, that the mere act of showing confidence in the economy would produce an economy worthy of confidence. The Fed’s hope of influencing the course of the economy with their words is undermined by their use of tools no one understands. One fears that includes the Fed. The Fed was more concerned last week with how their action or lack of action would be perceived by the market than whether it was the right policy. Having spent a year preparing the market for a rate hike and disappointing those expectations more than once, they had little choice but to finally follow through. The problems in the junk bond market took a back seat to the Fed’s reputation. The problem with the Fed’s communication policy, as I’ve pointed out repeatedly, is that its success is dependent on the Fed’s forecasting ability. Their lack of skill in that department means that a policy intended to reduce uncertainty – about future policy – has instead produced more. The course of the economy and markets will not be materially changed by the Fed’s policy adjustment last week. It does not change my view of the economy or markets one bit. The stock market has been making a broad top, producing no gains for the last 18 months. Treasury note and bond yields are low but preferable to credit risk at this point in the cycle. A recession, when it comes, seems likely to push those yields a lot lower while there seems little risk of inflation in a world beset by excess capacity in almost every industry. In short, duration seems a better risk than credit right now. The Fed has dominated the narrative for years now, investors and traders hanging on every word. Last week that started to change, the market repudiating the Fed’s outlook over a 48 hour period that must have produced some second guessing at the Fed. The heavy exertions of the world’s central banks have coincided with an economic recovery but that does not mean that monetary policy created the recovery. It may be that the weakness of the recovery is what we should be ascribing to monetary policy not its existence. The Fed’s ability to influence the economy through its words was always an illusion anyway. The economy is far larger than the Fed and it will do what it needs to do. When investors decide they don’t want to take the risk of owning junk bonds they will sell them no matter what the Fed does with interest rates or rhetoric. When they do there are real world economic consequences as credit availability is reduced at the margin. Volatile currency markets have an impact on capital flows and investment, changing the global economy in ways the Fed can’t anticipate and can’t factor into its models. 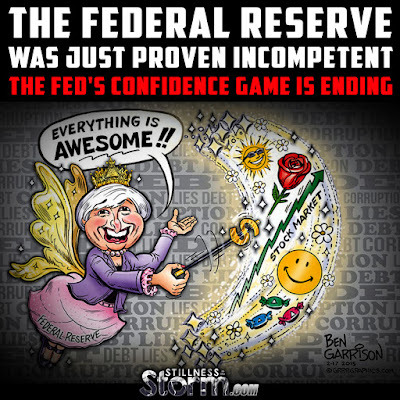 The Fed is no different than any other government planning agency, falling victim to the fatal conceit, the pretense of knowledge sufficient to shape events in knowable ways. The Fed’s confidence game is coming to an end.